No one ever said starting a side-hustle was going to be easy. In fact, building a business on the side of your 9-5 day job brings with it a unique set of challenges. That’s not to say it’s not worth the effort and sacrifice. There’s nothing more satisfying than building something that allows you to do more of the work you care about and adding extra flexibility into your lifestyle. 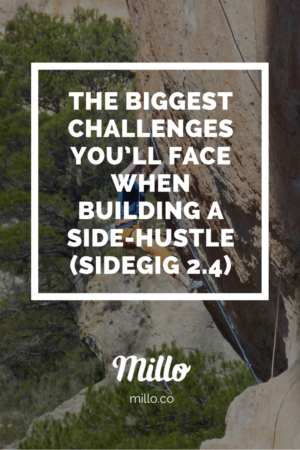 In today’s episode of Sidegig, Ryan, Ian, and I dive deep and get honest about some of the biggest challenges you’ll face as you attempt to start, run, and scale your side-hustle. From how to talk to your boss about your business to balancing your two jobs (yes, you now technically have 2 jobs) with family and other obligations, to staying focused and avoiding burnout; it’s all here. But the episode isn’t all doom and gloom. We also get real about tactics and tips that have worked for us as we’ve each built successful side-hustles. For future updates, subscribe to the newsletter or subscribe to the podcast on iTunes. You can also listen to all previous episodes here. We’d love an honest rating and review on iTunes—do us quick favor, pop over to iTunes and let us know what you think of the show. We’ll be back on Jan 3 with the last half of season 2. May you enjoy celebrating this holiday season.